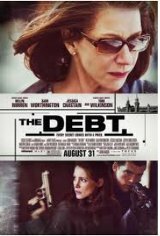 The espionage thriller begins in 1997, as shocking news reaches retired Mossad secret agents Rachel and Stefan about their former colleague David. All three have been venerated for decades by their country because of the mission that they undertook back in 1966, when the trio tracked down Nazi war criminal Vogel in East Berlin. At great risk, and at considerable personal cost, the team's mission was accomplished — or was it? The suspense builds in and across two different time periods, with startling action and surprising revelations.